Safi is our more intimate double suite boasting deep red walls which complement the exquisite Moroccan lights and beautiful hand painted furniture. At night the woven sequin bedspread twinkles in the flicker of candlelight, and the room has a uniquely special charm. In addition to an en suite bathroom with a spacious mosaic tiled shower (and not a bath), this suite also boasts a private outdoor shower complete with traditional Moroccan lanterns. The suite opens out onto La Fontaine, a furnished garden court where you can leisurely sit or lounge on the daybeds and enjoy the outdoors. If the evening turns cool, light a fire in the metal fire basket and keep snuggly warm while gazing at the stars. 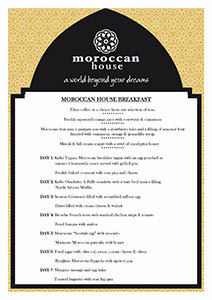 A scrumptious 3-course Moroccan breakfast is included (from 7am-10am). We also offer a complimentary range of teas, freshly ground coffee, home-made rusks, rose and hibiscus cordial, orange juice, bottled water and Coke. Cancellation within 7 days of arrival or no-show, full amount is charged.